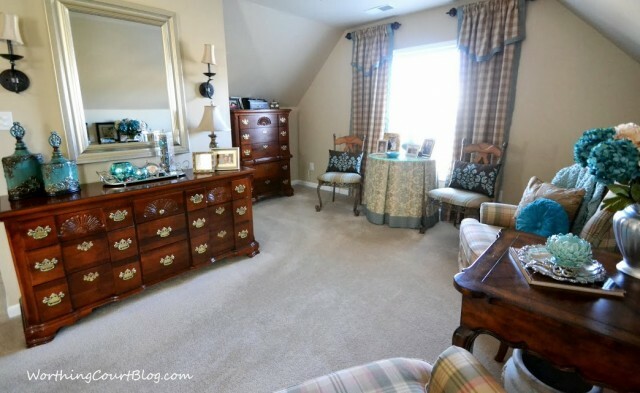 UPDATE: I hope you enjoy this makeover reveal of the master bedroom in our former home. We’ve moved to a new-to-us house that we’re remodeling from top to bottom. Check out what we’re doing HERE. I’m happy to report that my budget master bedroom makeover is finally complete! This project was many months in the making, but we finally have a retreat that we can truly enjoy. The first thing we did in this room was to paint it a lighter color. I was convinced that I would love the darker color that it originally was, but it made it feel too much like a cave, especially at night. You may not be able to tell, but the room went from a milk chocolate brown to a much lighter custom mixed color from Sherwin Williams. I know that some of you will ask about the color, but I really can’t tell you what it is. It was in between two shades on a color swatch and then I had them tweak it some more. Anyway, I made these skirted, rod pocket drapery panels and added blue banding to them. We all know how expensive drapery hardware can be, so click HERE to see my budget solution. 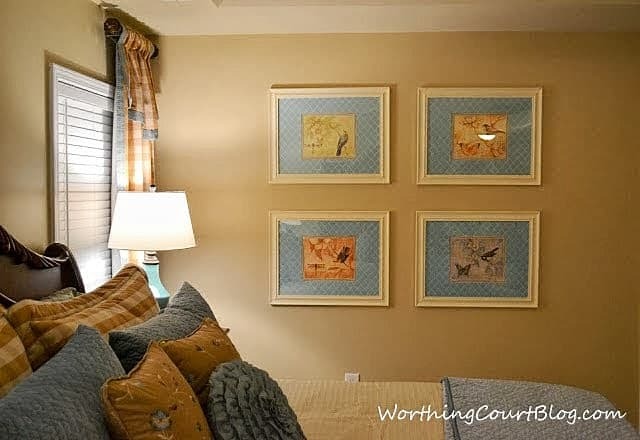 I had to make two pairs of draperies – the ones above that frame the bed and another pair to frame the window in the seating area. The draperies were a big job that I was glad to get checked off of my to-do list! Next up was the bed. I found a not-so-terribly-priced coverlet at Target. Since this is a budget makeover, I gave a lot of thought to making my own bed cover of some kind. In the end though, I figured that by the time that I bought all of the fabric to make and line the bedspread and considered my time, I would have spent nearly as much for a diy version. Now pillows – gotta have pillows! I made the pillow shams and throw pillows myself. I rarely buy a pillow, but I found the cute ruffled one for a good price and knew it was something I wouldn’t want to fool with making so it jumped into my hot little hands. 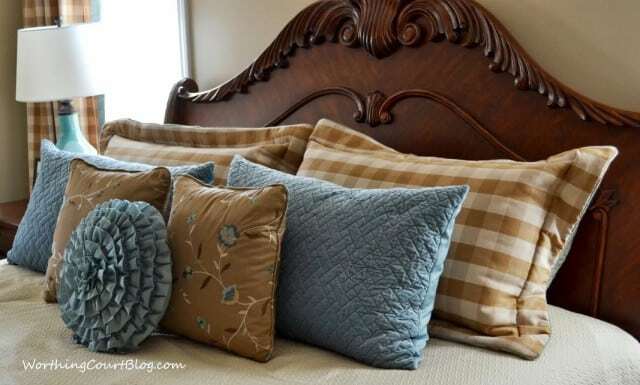 If you’re interested, you can click HERE for a full tutorial on how to make a pillow sham. There is a large wall on one side of the bed that I wanted to fill with some kind of artwork, but it needed to be on the cheap since this is a budget makeover. I was able to make my own after purchasing some very inexpensive frames, a calendar, some wrapping paper and poster board. You can read more about how I did it HERE. In spite of the large size of the room, there really wasn’t a great place to put our dresser, mirror and chest of drawers. You would think that the logical place for the dresser was across from the foot of the bed, but it just looked lost on that big wall. So both pieces of furniture wound up in the sitting area, which was the hardest part of the room for me to deal with. This is the part of the room that is the biggest waste of space for us. We aren’t sitting room people – we don’t sit in our bedroom to read or watch tv – all we really need is a place to put on our socks and shoes. But the space is there so I had to do something with it. Fortunately, we already had all of the furniture that we needed to fill the space. 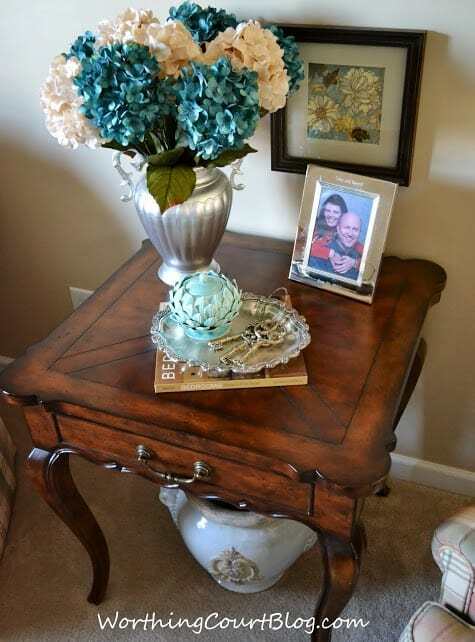 The vivid blue of these hydrangeas really adds a nice pop of color to this little spot. I love being able to use family heirlooms around the house. This silver tray was a 25th wedding anniversary gift to my parents many years ago. 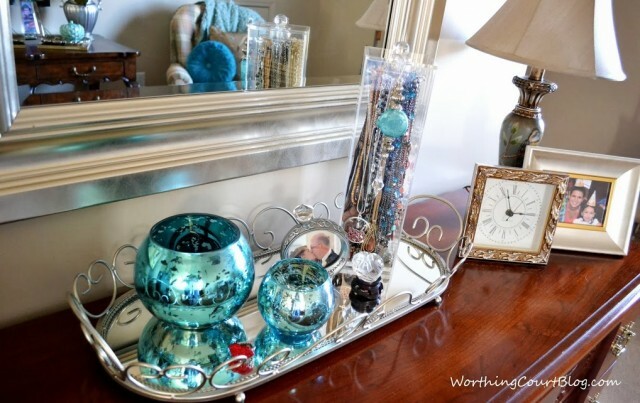 Over on my dresser, a mirrored tray is great for holding my jewelry. The blue mercury glass bowls are really meant to be candle votives, but I use them to hold my watches and rings. Two chairs with recovered seats and a decorator table help to fill the space under the window. 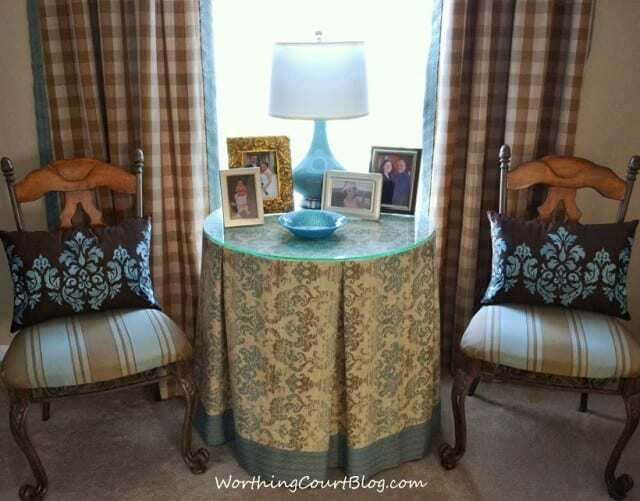 The box pleated tableskirt that I made adds one more fabric element to the room. 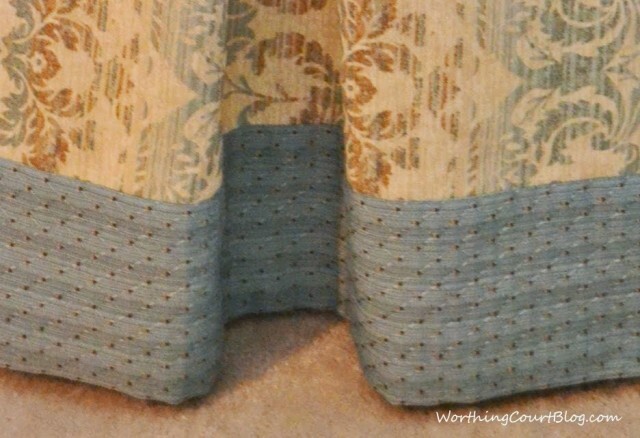 The banding detail that I added around the bottom is the same fabric as the banding on the draperies and helps to tie things together just a little more. 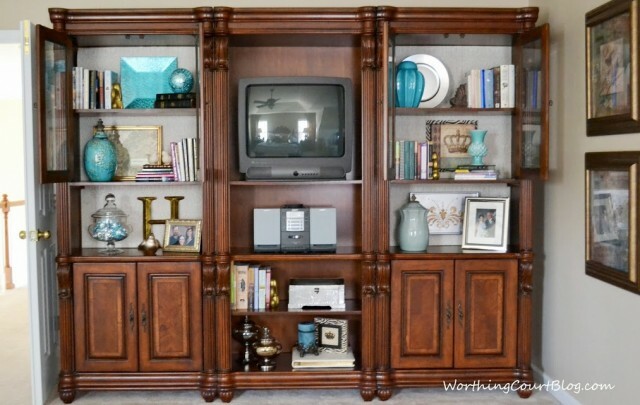 A triple bookcase sitting across from the foot of the bed received a makeover too. That’s my sweet Diva Dog shadow at the foot of the bed. 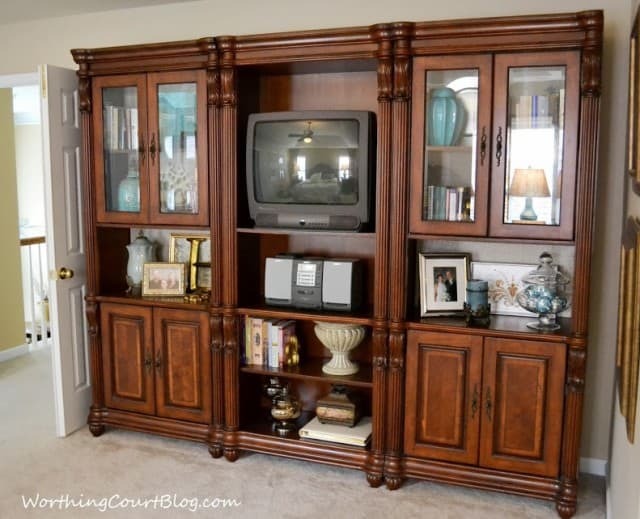 The bookcases were blah and boring and in need of some minor repairs. You can read more about their makeover HERE. The glass on the front creates quite a glare, so I’ve opened them so you can get a better look at the interior. 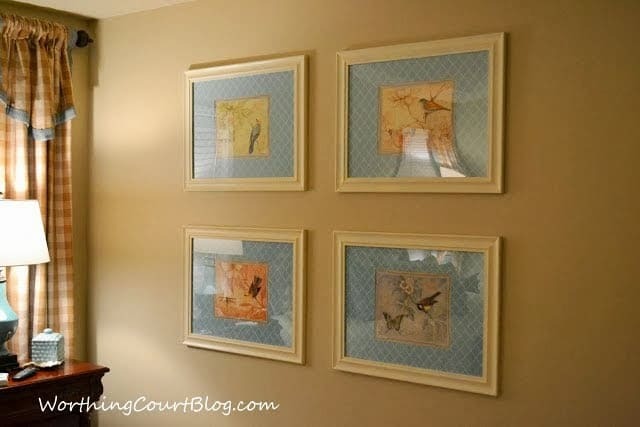 There are many individual projects that went into the makeover of our bedroom. You can read all about them HERE. And to tour the rest of our home, click HERE. Oh how pretty! I love what you have done in here. Love that you have a sitting area, and I love your checked window treatments. You have done a fantastic job! 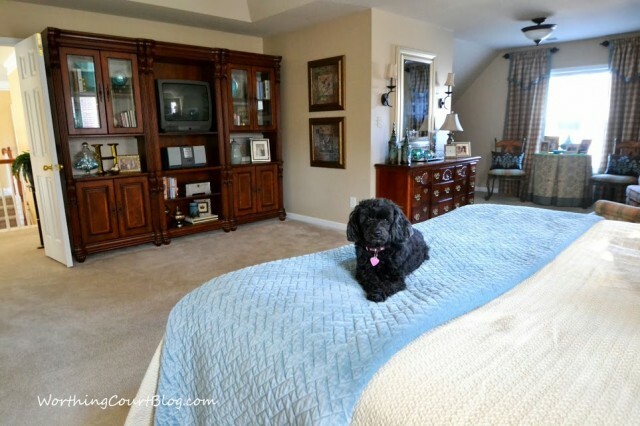 Wow, Suzy, your bedroom is huge! It’s more like a master suite! I love the colors you’ve chosen, and your decorative vignettes are beautiful. Thanks for sharing your lovely room. Hope you can stop by my blog for a visit. I’d love to see you again! Very pretty….the colors are gorgeous. 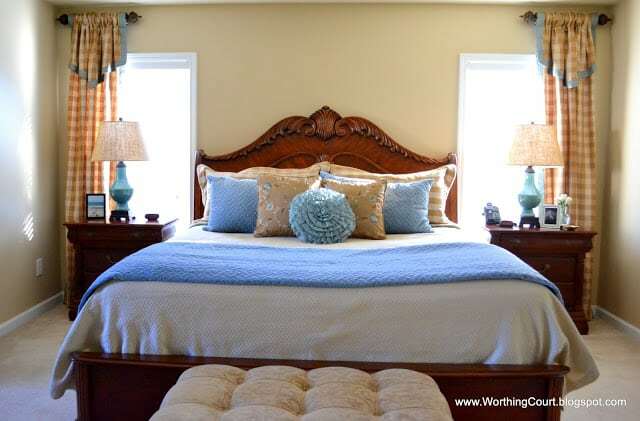 Years ago I had a brown and light blue room…it was one of my favorites! Suzy its just beautiful. This is a huge space too. I love all your fabrics. I know you are pleased as punch with the results. Great job! I followed you as the project progressed but it is so much fun to see it all together and get a better feel for the how the room flows. You professional skills are amazing. I love how you pulled all the colors around the room. Suzy, what a beautiful room! The blue is so pretty and soothing! All of your vignettes look wonderful. You did a great job! Beautiful transformation! Love the serene blue accents! The vignettes are all so lovely! Suzy, great job on the transformation!..Love the colors!…I am following and looking forward to your posts and meeting you personally!! Wow! You have some large beautiful bedroom! I love all the changes you made. All your treasures are displayed so nice. The bedding and the drapes are stunning. Hi Suzy! What a large and beautiful bedroom! I love the colors and your furniture is so pretty. Thank you for linking to the Open House party. Wow, Suzy, you certainly know how to pull things together in a most beautiful way. Love the colors you have chosen, and your window treatments are beautiful ……. I would expect nothing less…..lol! I love the window treatments. Did you make them? Thank you so much! 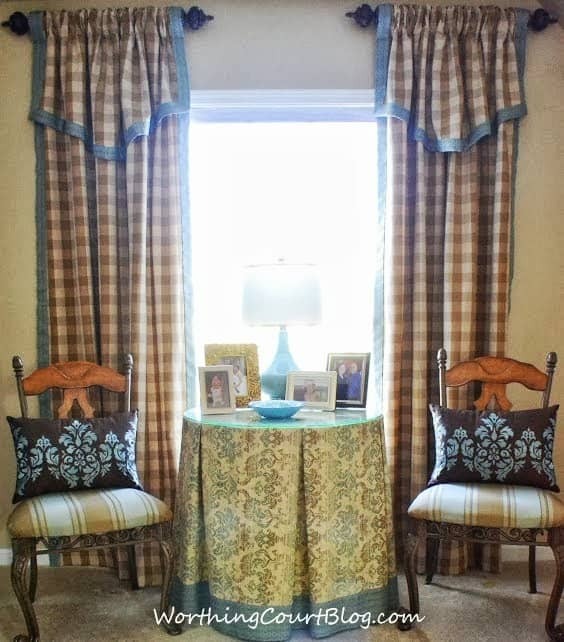 Yes, I made the window treatments, the boxpleated tableskirt, the pillow shams and the smaller square brown pillows. Hi Suzy! Your bedroom is so gorgeous! Love that blue color you’ve used. What a wonderful space you have under the eaves. Your room is huge! 🙂 Your drapes are so pretty and your dilemma wall – gorgeous! So nice! Classically beautiful. Visiting from Naps on the Porch. What a nice big room. The colors and accents you used look wonderful! I don’t even know where to begin. This is a beautiful room, magazine worthy for sure. I like your curtain treatments and all the touches of blue and the sitting area and the lamps and I could go on and on. I have to tell you that my folks still have 2 pillows like yours that my grandmother made years ago. Theirs are gold corduroy. Yours is the second blog I’ve ever seen them on. ACK! I had a long comment and my browswer crashed. I hate when that happens. Just wanted to tell you how beautiful you room turned out. Your bed is wonderful, and I even like those rockers you want to recover. Sometimes it’s nice to have something a little unexpected, and I think the plaid and other colors is that part. I’ll be showing this post to my mom. She is redoing her Master bedroom too. 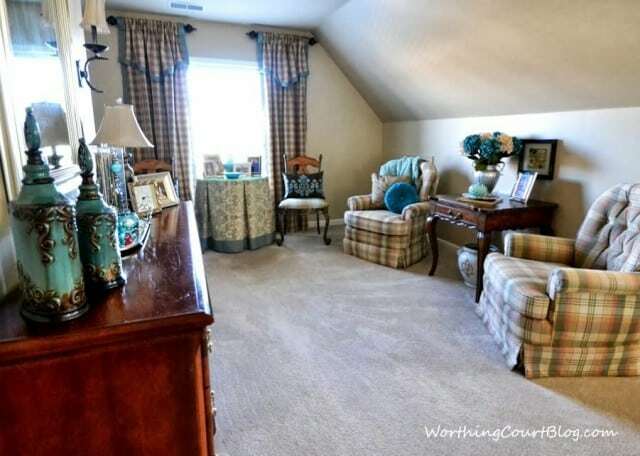 Her walls are blue and the furniture is dark, so she’s been looking for ideas to bring in more color. I’m sure she’ll find inspiration from your lovely room. Thank you so much for linking to my party, and I hope you will come again next week! Hi Suzy! Your bedroom is so gorgeous! Love that blue. The room is magazine worthy. Oh WOW, it’s totally gorgeous!!!! Such a beautiful room and I adore your sitting room–Ohh la la!!! Very nice, love you color choices..A very pretty place to spend time..
What lovely changes you made. I love the blues. I am really into blues now and so I am really digging what you have done with your bedroom. Visiting from TTT. Thanks for sharing. What a lovely relaxing space. I know you must be thrilled to have it finished. Happy to be a new follower from Wow us Wednesdays. Your bedroom is lovely. You are a very talented decorator! Great transformation, Suzy. Love the color palette and what a nice big room. I would love a sitting area like that. Thanks for sharing at Wow. Hi again Suzy. Just wanted to tell you I featured your beautiful bedroom on my party featured today. Thanks so much for sharing, and I’d love to have you back next week. If you’d like, there is a feature button on my blog if you’d like it for your sidebar or feature page. Thanks for linking up and don’t forget about registering for my current giveaway…. Your room is beautiful! 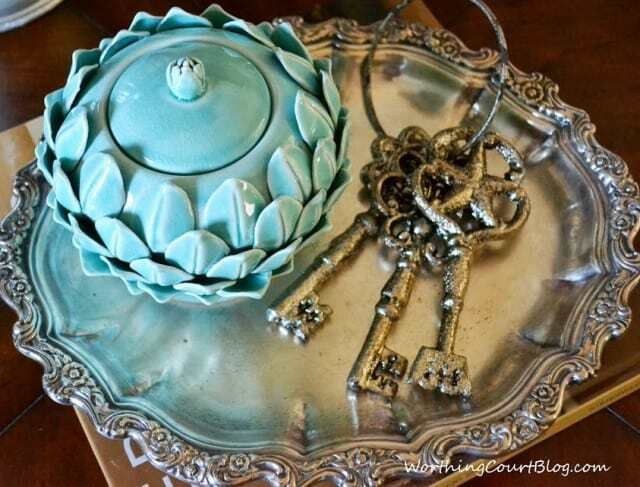 Thank you for sharing your lovely post at Potpourri Friday! Wow! What a transformation! This would be a perfect project to link up at our “impossibles” party today! Stop by and link up! Hi Pam. I bought those urns last spring. So sorry you weren’t able to find any. Thank you so much for your kind comment! So nice and I love your curtains. I’m going to make that box pleated table skirt. I have to remake the covering for mine and that is so unique. I love it! One tip on your chairs…you can have them recovered and not have them button tufted, or you can just do slip covers. Your sitting room turned out very well. Had to come back two times…. could not leave a comment on your blog for some crazy reason today! Thanks sooo much for sharing you lovely and restful sanctuary with us! Just beautiful! Love the colors and the details. It looks great. Where did you get the necklace holder on the dresser? 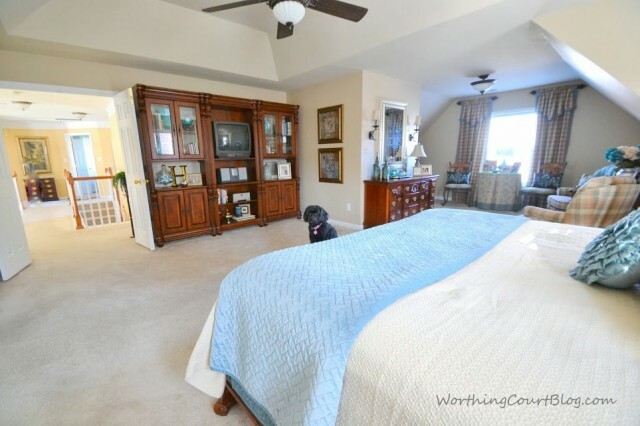 Suzy, Love your master bedroom. I especially love your drapes. Have been looking for fabric like that but all I have seen has been too expensive. If you still have lots of yours left, I would be interested in purchasing some. Hi Linda. Would you please email me so we can discuss? My email address can be found on my About & Contact page.